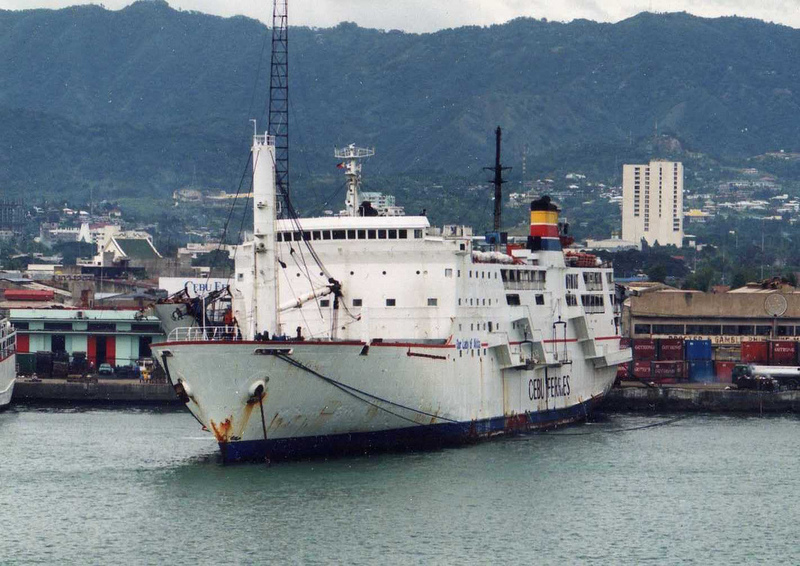 The “Wilines Mabuhay 2” was the second liner in the luxury series “Mabuhay” of William Lines that was designed to compete with the luxury liners of Sulpicio Lines and the SuperFerries of Aboitiz Shipping. In terms of size, she was not as big as the great liners already existing then like the “Princess of the Orient”, the “Mabuhay 1” and the “Princess of Paradise” and neither was she that fast. In terms of match-ups, she was more the match of the SuperFerries in terms of size, speed (except for “SuperFerry 1”) and amenities. All around everybody called her simply as the “Mabuhay 2”. 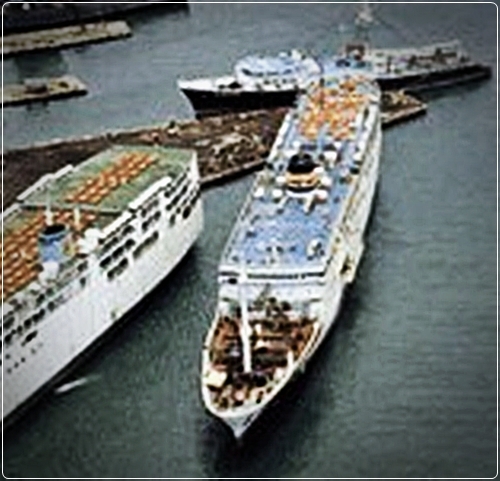 The “Mabuhay 2” was born as the “Naminoue Maru” in Japan in 1980. Incidentally, the earlier “Naminoue Maru” built in 1962 also came to William Lines where she was known as “Tacloban City”. This “Naminoue Maru” of 1980 with the ID IMO 7920871 was built by Towa Shipbuilding in Shimonoseki, Japan for Arimura Sangyo or A” Line. She had raked stem and a cruiser stern, two masts, two funnels, a high bridge and two passenger decks. She had a deck crane at the front which was used for lifting container vans and two quarter ramps at the stern leading to a car deck so making her a RORO ship. The ship measured 140.5 meters by 20.5 meters in length and breadth with 4,886 gross register tons as cubic measure and 3,119 deadweight tons in load capacity. She was powered by two Niigata diesel engines with a total of 15,600 horsepower and that gave her a top speed of 20 knots when new. She had a sister ship here, the former “Akitsuki” also from A” Line which also came to William Lines where she was known as the “Maynilad”. The “Naminoue Maru” was sold by A” Line to William Lines in 1994. She was refitted in Singapore and a deck was added to her. The cargo boom at the front was also removed and three foredecks in a terraced design were also added and above that a promenade deck was made. This made the ship look great and modern. The mezzanine deck for sedans was also converted into added passenger amenities. With this renovation, her gross tonnage rose to 4,996 which looked to be an underestimation (her sister ship Maynilad had a gross tonnage of 6,538) and the net tonnage was 2,009 which seems to be an underestimation, too. The new passenger capacity of the ship was 2,015 which was significantly lower than sister ship “Maynilad” and that meant there were more passenger spaces and amenities aboard her. With more steel now and with 15 years of sailing mileage already her sustained top speed here was reduced to 17.5 knots which was about average for liners brought out in the 1990’s. Her container capacity was 110 TEUs. These container vans were aboard trailers and moved by trailer caddies so loading and unloading was fast. 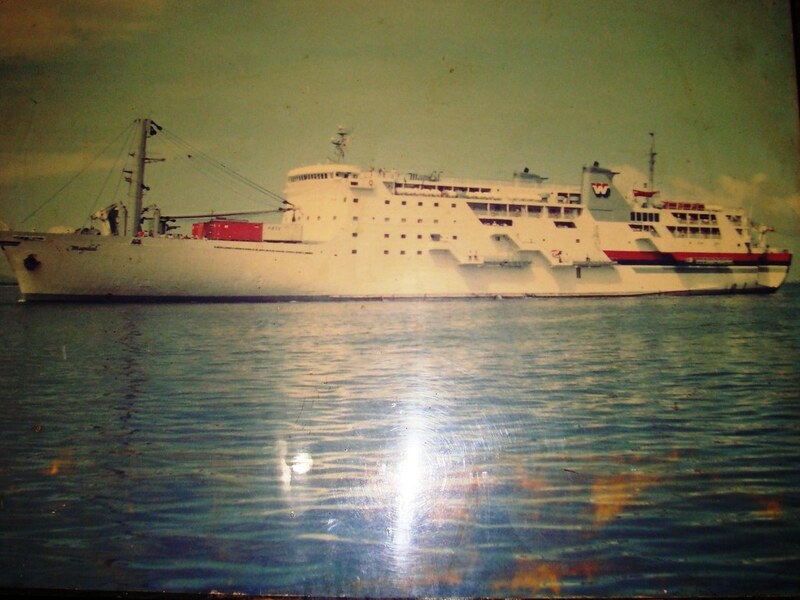 In sailing for William Lines starting in 1994, she was assigned the Manila-Surigao-Butuan (Nasipit)-Tagbilaran-Manila route and within the same week she sailed a second route, the Manila-Tagbilaran-Cagayan de Oro-Tagbilaran-Manila route which were completely new sets of routes of William Lines. She was being made to run like the SuperFerries with just a few in-port hours. One unusual twist of their routes was the lack of intermediate ports of call and in obviating a Cebu docking. She was mainly a Northern Mindanao liner for William Lines. She left Manila for Surigao every Thursday at 7am (which I remember was the earliest departure from North Harbor) and this was a direct route and that was unusual for Surigao ship. She left for Tagbilaran every Sunday at 12mn. For the direct Tagbilaran route she took 27 hours for the 429-nautical mile route. This was not at full speed as she arrives at early dawn anyway. For the 459-nautical mile Surigao route, she took 27 hours of sailing. 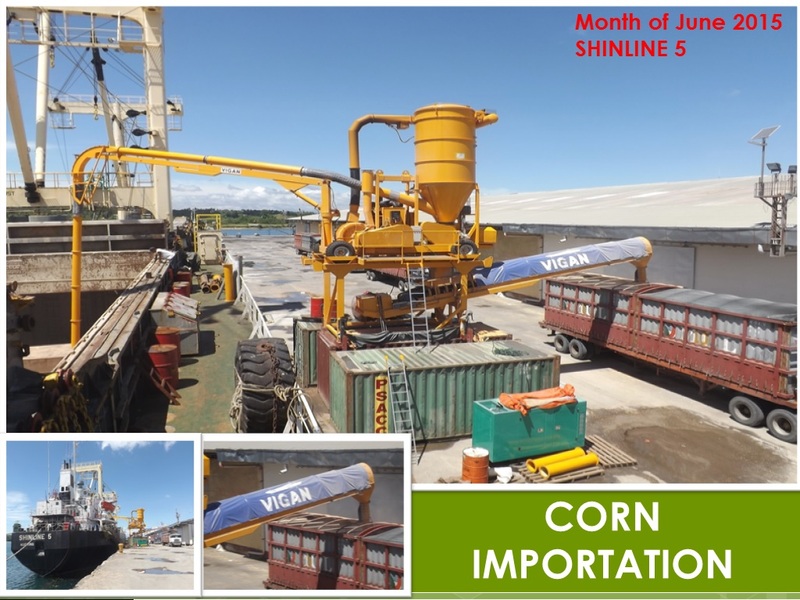 Its Surigao route was the fastest then in the local shipping industry. 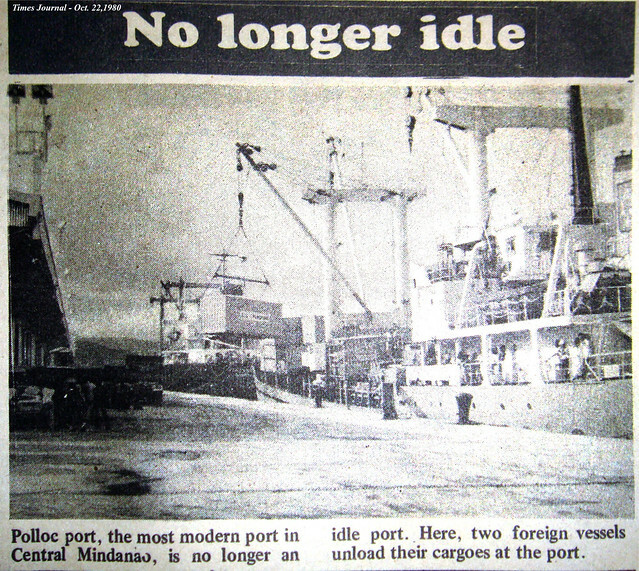 Before the fielding of Mabuhay 2, William Lines did not have Surigao as a port of call. So that was actually an expansion in the route system of William Lines. She had seven classes of accommodations – the Special Suite, Suite, Cabin for 2, Cabin for 4/6, Deluxe Cabin for 4/6/8, Deluxe Tourist and the usual and popular Economy. Her Deluxe Tourist was nice for a Tourist but that was the Tourist I remember that had the biggest gap from the next class Economy at almost double. The difference between First Class and Deluxe Cabin was the latter had only a wash and no toilet and bath. The Special Suite was bigger and more opulent than Suite. Economy was the only class without airconditioning and it was the cheapest. All passage classes in the ship were entitled to free meals and there were three restaurants – the First Class restaurant, the Tourist restaurant and the Economy restaurant. The restaurants were located on the stern or rear of the ship. But like in the rest of the shipping industry Suite passengers can opt to take their meals in their cabins and it will be served there. The cabin telephone is available for that purpose along with other requests. She had the usual amenities for liners like lounges, lobbies, front desk and promenade areas/viewing decks. Aside from viewing decks on the side which was limited to the open-air Economy class because she was fully built-up to the sides, she had that viewing deck above the terraced foredecks ahead of the bridge. She also had another viewing deck at the front ahead of the Tourist section and below the row of Suites. Those two were probably built as compensation for the lack of viewing platforms on the side because she had no outside passageways. The restaurants also functioned as additional lounging areas.She also had kiosks and a game room/arcade plus a grooming salon. The “Mabuhay 2” did not sail long as a liner for William Lines b ecause the merger of William Lines, Gothong Lines and Aboitiz Shipping happened which resulted in the creation of the shipping line WG&A Philippines. This came about on the first day of 1996 although the agreements and preparations for the merger were already underway in the last quarter of 1995. In the new combined fleet, she was designated as the SuperFerry 7. In this new company she was given a new route route assignment which was a twice a week Manila-Tagbilaran-Iligan route and she left Manila every Thursday 12 midnight and every Monday at 9 in the morning. In WG&A, her accommodation designations also changed. Enumerating low to high, it is now Economy, Tourist, Business Class for 2/4, Cabin for 2/4, Stateroom and Suite. Comparing rates for the common Tagbilaran port of call, the rates for all classes except two actually dropped. However, one purchases the Stateroom and the Suite as a room and not by individual. There was not much change inside the ship as the Mabuhay series was approximately equal in furnishings and comfort to the SuperFerry series. One major change though in WG&A was all ships initially started with no free meals like in the SuperFerries before the merger and one had to pay a la carte. However, this caused such a furor and even outrage and a lot of protests. Passengers after all since the early times of shipping here were used to free meals and meals that led to contentment at that. I was witness to how noisy were the protests and I saw how the ship management caved in and gave free meals to the more vociferous ones. After that, it was like the dam had burst and there was no holding back in giving free meals again. But what I noticed was the rice portion was too small because they were selling extra rice! Still there were protests why there was no free soup! And no free desserts like in Sulpicio Lines! I can only watch in pity and amusement how harassed were the restaurant crews in the early days of the WG&A liners (I was a frequent traveler in those days and I happened to sail with SuperFerry 7 many times). SuperFerry 7 did not sail long for WG&A and she actually was not assigned to any other route because of that. On March 26, 1997, an unfortunate incident happened and the ship was hit by fire while docked in Pier 4 in Manila North Harbor. There were no more passengers left as the ship had already finished discharging them. She was towed out of Pier 4 so that the fire will not leap to the other WG&A ships docked in Pier 4 like “SuperFerry 12” and the “Our Lady of Medjugorje”. However, the fire completely gutted her superstructure and she capsized near the ports after the pumps failed. Later, the formal investigation concluded it was an electrical fire that started the conflagration. In a few months. her insurer paid for the coverage of the ship and they even announced it in a local daily. The remains of SuperFerry 7 was then raised up and she was subsequently demolished by the salvors. Mabuhay 2 only sailed here for three years. Very short. She was the first hull loss incident in the fleet of WG&A.